The ritual preceding the Cham—an offering of the Fifth Shamar’s abridged form of the Sixth Karmapa’s text Incinerating the Hostile—began at 11.00pm on the 24th February. Vigorous chanting accompanied by the beat of both large temple drums and hand-held drums, punctuated by a crescendo of cymbals, gyalins, great horns and the wailing of kanglins [thigh-bone trumpets] could be heard all night across the vast grounds of the Garchen, the Monlam Pavilion and Tergar Monastery. Finally, at 5.30am the ritual finished, exactly on time. The stage was set for the next major event of the Gutor, the great Cham dance. Both the performers and the audience are intended to approach the dance in a meditative state. As the dancers are imagining themselves as the deity, they think that all the physical motions they make are the expressions of the deity or the deity’s motions. Likewise, the spectators of a lama dance should not think of lama dancing as an ordinary performance or ordinary dance. If you know how to practice the mantra, it is important to train in the pure perception connected with tantric practice and think that you are actually seeing the deity, meditating on faith. Purifying ourselves of the fixation on ordinary appearances is of primary importance in the mantra, so it is very important for the performers of lama dance to try to block the fixation on ordinary appearances and for the spectators as well to put effort into blocking fixation on ordinary appearances. Today during the first dance, the Female Guardians of the Gate, a few extra dances will be inserted in order to restore any violations of samaya. 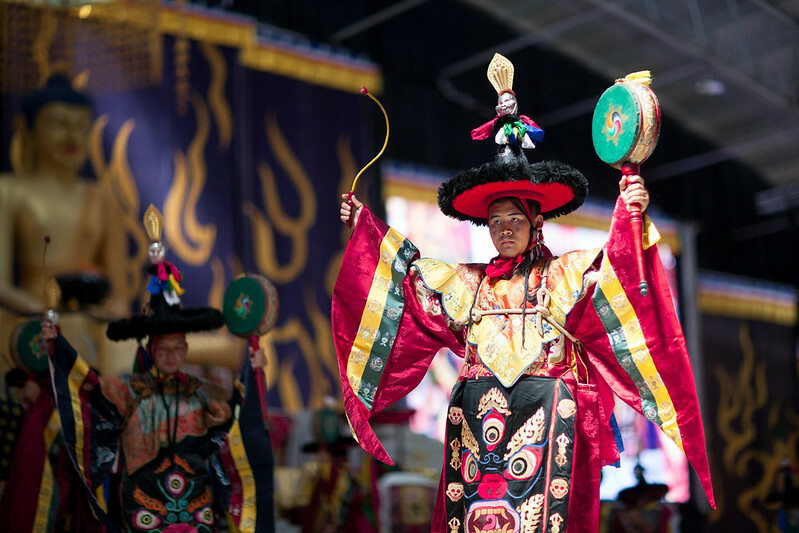 When the Black Hat Drum Dance is performed at Tsurphu Monastery in Tibet, the Female Guardians of the Gate and Shingkyong are not usually performed along with it, but today is different and we will perform the Female Guardians at the beginning and Shingkyong at the end. The Gyalwang Karmapa observed the dances from the penultimate tier on the right wing of the stage. Seated next to him were Goshir Gyaltsab Rinpoche, Yongey Mingyur Rinpoche, Shiwa Lha Rinpoche, and Bokar Yangsi Rinpoche, opposite him, on the left wing with the musicians, in perfect symmetry, sat the young Drupon Dechen Rinpoche, reincarnation of the abbot of Tsurphu. But before the Cham began, the great Hazhel torma was escorted in a great procession by monks from Rumtek Monastery and lay members of Tsurphu Labrang from its booth onto a platform at the front of the stage . The Vajra Master, dressed as the Go-Ma (Guardian of the Gate), swirled a black cloth to keep any spirits from escaping as the Hazhel was moved. Then began the Go-Ma Cham, a solo dance by the Vajra Master from Rumtek Monastery, representing the Four Female Gatekeepers. Each gatekeeper has a different weapon to ensnare the ‘enemy’ of ego-clinging and thrust it into the effigy at her feet, concealed by a red cloth. It is caught with a hook, captured with a lasso, bound in chains, and intoxicated with the sound of the bell. This effigy will be burnt later along with the Hazhel. As the Karmapa had said, the Go-Ma dance this year also incorporated the Deer Dance, the Dance of the Demons, and the Skeleton Dance. The latter are the four Lords of the Charnel Ground. Immediately they appear, the music changes, clashes of cymbals transform into the jangle of jiggling bones. The tight-fitting costumes marked with lines for bones are quite life-like, particularly the red-gloved hands, empty fingers dangling and painted white to resemble finger bones. Reminders of the Chöd practice, these skeletons too are warriors in the battle against ego-clinging. If you watch the dance closely, you will see that there are some child-like movements, and this is because he choreographed it when he was just a child. This the first time that the great Mahakala Puja—the longest Mahakala puja—and Black Hat Drum Dance choreographed by the Sixth Karmapa Thongwa Dönden have been performed together in the Noble Land of India. You could also safely say that it probably also hasn’t happened in Tibet either for two or three hundred years. The tradition of the dance was almost lost following the disaster which befell Tibet in 1959. Fortunately, the lineage of the dance was preserved in Tibet at TsaTsa Monastery and in exile by Tenga Rinpoche at Benchen Monastery, Nepal. It was Tenga Rinpoche who learned that the dance had been preserved at Tsa Tsa Monastery, near Derge in Kham, and suggested that the Karmapa contact them. After some research, it was discovered that there were some differences between the Benchen and TsaTsa versions of the dance, but as TsaTsa had all the text and instructions complete with a history of the lineage which proved it came from Tsurphu, they had decided to follow the TsaTsa tradition. Tsa Tsa Monastery had then sent a video of the dance for the Karmapa to study. In this way, it had been possible to follow the authentic tradition and revive it at Benchen. Because it takes so long and requires so much energy, the dance was punctuated by short breaks during which the dancers were fed saffron rice and rich Tibetan butter tea to keep their strength up. Just after 2.00pm, the covers on the Mahakala and Mahakali images were removed so that the Gyalwang Karmapa assisted by Goshir Gyaltsab Rinpoche could make the libation offering—the serkyem. His Holiness threw the great cup—attached to coloured ribbons of green, blue, white, yellow and red, signifying the five Buddha families—high into the lap of the magnificent Mahakala. The end of the Black Hat Drum Dance segued without a break into the Dance of Throwing the Torma. This Cham was choreographed by the Third Karmapa Rangjung Dorje, based on the Mamo Tantra from the Nyingma tradition. Then began the final rituals involving the Hazhel torma. The Black Hat Dancers with Drums danced down the aisle, facing this way and then that, as far as the entrance to the pavilion but no further. The great Hazhel of Mahakala, carried on a pallet by twelve monks, made its way slowly in a grand procession out of the Monlam Pavilion and into a field at the back, where a twenty-foot-high, triangular pyramid of hay had been prepared. It was placed inside the pyramid along with the effigy and invocations were chanted. At this point, the concentrated power of the Hazhel was released in an explosion of spiritual power known as the torma attack. This destroys the accumulation of negativity and obstacles ‘trapped’ in the effigy. The pyramid was set on fire and immediately burned fiercely. As long tongues of flame leapt out, spectators backed away. Swiftly, the blaze reduced the Hazhel and the effigy to a pile of ash. The final dance of the Cham, Shingkyong, was performed by a second group of monks from Benchen Monastery. Shingkyong is the lion-faced protector in the retinue of Four-Armed Mahakala. He is said to be an emanation of Chakrasamvara and of Four-Armed Mahakala, and became a protector of the Karma Kamtsang during the time of Karma Pakshi. Shingkyong is considered a particular, important protector of Benchen monastery. So I have asked them to perform Shingkyong today so that the rebirth of Kyabje Tenga Rinpoche may return quickly and to pacify all the omens of obstacles to that occurring. Since the previous Monlam, the monks of Benchen Monastery have been engaged in various pujas prescribed by His Holiness to remove these obstacles, and everyone prayed that through the positive effect of these different activities Rinpoche’s reincarnation could now be found.